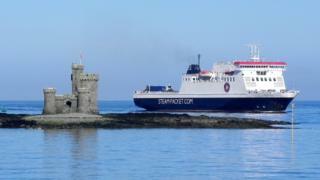 The terms of a new Isle of Man's sea services deal which could see foot passenger fares frozen and a ferry replaced has been approved by Tynwald. The proposed 25-year deal with the Isle of Man Steam Packet Company will give "significantly greater" control, the Department of Infrastructure said. It would see control of the linkspan on Victoria Pier, which connects the ferry to the harbour, transferred to the Department of Infrastructure, an extra weekly sailing to Liverpool added and crossings to Ireland moved to become more convenient. Infrastructure Minister Ray Harmer said deal would give the department "significantly greater levels of strategic control over the provision of ferry services". "It will enable us to further secure our strategic links for future generations and ensure that the island's ferry services continue to meet our needs for the next 25 years," he added. The new deal, which will come into force on 1 January 2020, will be reviewed every five years.